Now, isn't that a sight to make your heart go 'pitty-pat' ? This parcel arrived just ahead of the weekend. Now I must add that this isn't all mine (unfortunately). This is a two weaver order from Yarns Plus. They sell tencel and chenille: some custom colourways in both and solid shades. The Christmas sale at the gallery has gone well for me. I arrived there Saturday afternoon to work my shift to see two of my snowflake runners going to a new home and later the same day, the white lace shawl and two scarves were gone too. So not much will be coming home when it wraps up next Thursday. Then the close up, featuring the colours terra cotta and cashmere chenille out in front, iris and royal in behind. I didn't get any chenille myself as I have a large selection. I haven't been inspired to weave chenille lately but handling these yummy cones may have done the trick. Now here are my cones of 2/8 tencel and it would appear that I have been avoiding the blue end of the colour cards. Mauve and mineral green are in the front, with aqua and coral on the left hand side. Ngaire recently did a lovely project using the coral colour and I was quite impressed so add it to my order. At the far right is 2/10 in black. Don, at Yarns Plus, says that they are going out of the 2/10 yarn size ( all colours, including white and black) due to supply and dye concerns. Such a shame as I much prefer this size of yarn. The cloth is just as lovely but has a finer hand and not as much weight. I'll have to make sure that what ever the project is for my 2/10 is extra special. I'm going to be able to do some great colour gradations now and more of the iridescent effects! You could look at these all day and never get tired, only inspired! I did a post a few months ago about using colour cards and ordering yarns. Well, when I ordered my yarns I took a minute to inquire about what had been discontinued and what was new. I made the changes to my existing cards and had new chenille colour cards sent along so I'm up to date. Now with most companies, there is a small charge for these but sometimes when they come along with a big order, they are gifted...which is pretty darn nice! If you have weaving friends, why not try a group order from your favourite yarns store? You can share the postage costs and if they have a magic dollar level where you can then get the wholesale rate, then the savings really kick in! I know that at least three or four of the companies I like to order from do just that. Hard for one person to spend that much at once ( okay, maybe not... its the paying part that's tough!) but several weavers ordering makes it possible. So do you like a purple shimmer? This post today is one that has actually been preempted a couple of times as one or another topic pushed it to the back burner. Our area has been hit hard by flooding after a few days of torrential rains. The town is full of big name media trucks looking for the story and the images for night time TV news. While our home is okay, our lower property was flooded by our normally gentle creek. We had our own private lake for a time! The water levels have dropped thankfully. Further down the road and closer to town, approx 300 homes were flooded out and now a wet, soggy mess. It will be many months before they are any where back to normal again, if ever. Many lost all pictures and family mementoes. 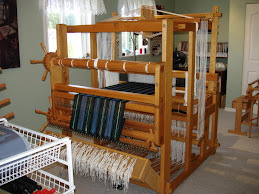 So now due to dealing with matters here at home, tradespeople and Christmas shopping, not much weaving has happened. This project is simply too pretty to hide for any longer though! The goal was to get some 'eye candy' scarves for the recent sale and to personally revisit the concept of iridescence. I took a three day workshop with Karen Selk of Treenway Silks back in 2000 or 2001, called 'Silken Kaleidoscope'. It was about putting more colour into your projects and trying varying types of silks for different looks and textures. I had been reviewing the workshop notes Karen had given each student and saw the page on iridescence. You use two similar grist (size) yarns in colours in tones of equal values. In the workshop we had used 2/60 silks in colours like a rich magenta and a deep teal. 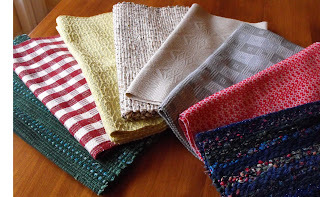 They were woven (slowly on table looms) in plain weave. The effect? Stunning! Think about some of the beautiful iridescent Indian sari's you might have seen... People are fascinated by this effect and love the chameleon like changes depending on how the light hits the cloth. I had altered this draft using my Fiberworks - PCW program and expanded the pattern so it has plain weave plus much more of the delightful fancy twill which makes it completely reversible. So this sett is 24 epi and uses 8 shafts and 8 treadles, but iridescence can be done on 2 shafts and 2 treadles if you weave plain weave. For best effect, use very fine yarns. The purple was very pretty and my personal favourite. I have tried to get good shots so it shows either the patterning and/ or the iridescence. Hope it comes through on your screens! So after two scarves, I cut off and prepped the scarves on the foam board for fringe twisting. See here for more info on how to do this. Then since both scarves have similar values of colour, I got out my beads and made some colourful choices. They had some beads in common together which helped narrow the choices! 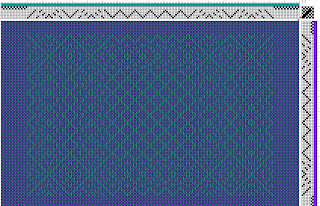 Here I am slowly working my way across the green weft scarf with beads that are greenish with a blue shimmer. Here they are side by side and, thanks to blogger, turned sideways! The second purple one is sold as well. Its for a lady who was watching me twist the fringes at our sale. Stiff fabric, no beads and she fell in love with it. Her gentleman friend is buying it for her for Christmas. Won't she be surprised to open the box and see that? I get a kick out of stuff like this... Me, a Christmas Elf. So before I close for this time, an update on our indoor flood. Seems I will be getting a new floor in my kitchen.... and also a new kitchen! I have seen and approved drawings for the new lay out and we have made many choices of colours, fixtures and appliances! Rarely have Hubby and I agreed on so many things so quickly together. Must be the 25 years of getting to know one another :) The carpenter said that he's never had anyone choose a laminate for counter tops so fast! I like to think that weaving has had some side benefits for both of us... an eye for colour, shape and form that we bring to everything in our lives. Me as I work with it daily and poor suffering Hub as he must listen to me. To be fair, I know an *awful lot* of the running of railroads big (real) and small (HO scale). The demolition and chaos start right after New Year's.... with the floor possibly coming out sooner so it can dry properly. Do you think I can weave through all that? I sure hope so! One last shot... it's so darn pretty! Well, I had every intention of getting back on topic with weaving (most) of the time but... life has a way of throwing a few surprizing curves at you! So here's new newest project with a 'twist' to the plot. We grabbed towels and starting mopping up water off the hardwood floor and Hub went downstairs to the laundry room for more (dog bath) towels....only to find that the water was coming through the ceiling... along to a light fixture and there was a sag in the ceiling with the weight of the water above ! So we shifted our attention to that room, conscious of the yarn stash just on the other side of the wall. *gulp! * The bulge let go and that was probably a good thing as the water drained out, rather than looking for another place to run to. In the picture below, you can see the line of water that ran right to the shared wall with the studio. Scary! Ah, there's my procion dyes... and ikat tape... yes, I was going to try that this past summer.... oops! Next year? So by the end of the afternoon, the laundry room looked like this and is drying properly. So if this ship is sinking, this band will play on! Back to the weaving! I had put my iPod on to drown out the noise and soldiered on. 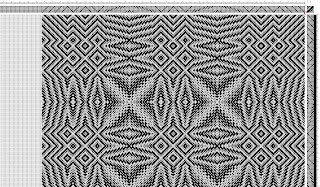 There was a brief glitch with a minor threading error, happily near the edge and I was quickly back in business. I did one repeat of the border in black to edge the scarf and my lighter weft is a silk/ camel blend in a soft tawny beige. The treadling is (as usual for me) a bit tricky and eventually the pattern becomes familiar and there is a logic to the numbers! Hubby came home and saw it and loves how fine it is.... and the fact that there is warp enough for three scarves has him hoping one might be for him? In the next post, I'll show you the twill towels on the big gal Emmatrude, which now look to be destined for my kitchen. I also got word that I sold this shawl at the sale today. Apparently the woman looked wonderful with it.... I hope she enjoys her coming Christmas celebrations! I'm going to celebrate with a yarn order :) Some say, pass the bottle... well, I say pass the yarn! It's Remembrance Day today.... and while my mind is on the current troops 'in harm's way', I also think on the contribution some of my family has made in years past. This is my paternal great grandfather Edwin Barton, who served with the Royal Artillery in WW1 and his wife, my great grandmother Elizabeth (nee Bowers) Barton. The young infant on their laps is my great Aunt Eileen, who is still with us in her 90's. They had four daughters: Eileen, Louisa, Edie and Bessie. Louisa was my grandmother and youngest sibling Bessie is also still with us in her 80's. Wars have literally shaped lives and my great aunt Bessie was one of the British war brides that came to Canada after WW2. 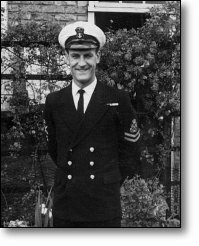 My father served in the British Royal Navy, starting at age 14. I found a great picture of him wearing his Royal Navy uniform in London 1955. He was a Chief Petty Officer when he left the service after spending time in south east Asian waters. 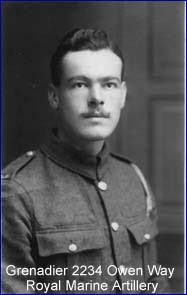 My father always attended or participated in Remembrance Day services and I can recall seeing him march or stand at the cenotaph on duty. He continued his service to others by being a police officer for many years. 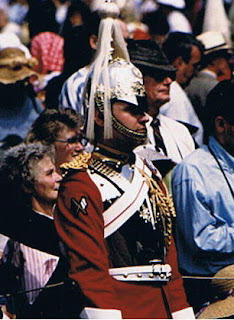 This is my cousin Simon in full dress uniform of the Queens' Horse Guard. He recently left the British Army after serving as an officer in Bosnia and later Iraq in the tank brigades. (To be truthful, I'm not certain of his unit) He is now in civilian life. My mother was one of three daughters. 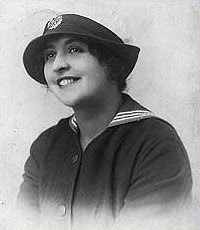 Below is my grandmother Emma (nee Worden) Way in approx 1918 in her Wren's uniform. She served at an naval airship station in Kingsnorth, England. This is my grandfather, Trooper Owen Way R.M.L.A WW1, her husband. He also served in the Home Guard in WW2. The First World War was also known as the War to end all Wars and so there was a huge patriotic push for everyone to do their part. People think that soldiers and sailors have some kind of special nature or aptitude to be called to serve their country. Then, as now... they are simply the ordinary sons and daughters of ordinary people like you and me. While reasons for why such duty is needed may be questioned, their courage and sacrifice should never. Thank you from a grateful Me. Big 'thank you' to Lynnette for sending me this photo of all the runners in the exchange! This is the one I received! I've been a member of the Guild of Canadian Weavers for some years now and four years ago, a weaving exchange was re-introduced to the members. The annual exchange has seen tartan tea towels, then card inserts, guest towels and this year, table runners. Lynnette has taken on the role of hosting this event for the past couple of years and does a wonderful job of wrangling weavers into a schedule with firm (?) deadlines! It must be fun to have all those parcels arrive and seeing what everyone has woven up. This year the plan was to weave a runner, then get a runner back. I dropped mine off in person this past September when we were there visiting. So I have had a bit of a wait to see what was coming. I received a lovely runner in soft greys in summer and winter, woven beautifully by Patricia, of Prince Edward Island. It's in 2/8 cotton and I must say that 2/8 cotton has never looked so good! Thank you Patricia and Lynnette. The parcel also includes the draft and record notes so that you can reproduce the pattern. 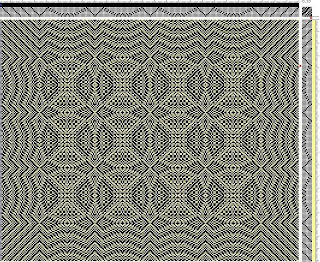 Below is the runner I submitted and Patricia received and to refresh, it's 2/16's cotton sett 36 epi with 2/30 linen weft. This past week I attended a demonstration on the features of Fiberworks-PCW weaving program by program designers, Ingrid Boesel and Bob Keates. They recently relocated from Guelph, Ontario to Salt Spring Island so are practically neighbours here. I learned a lot about the program and how to use it more effectively for designing. One nice fringe benefit of the demo was on how to capture the drafts and so I can show you them here at the blog. So below is my first effort! Next up is how to make it large enough for you to read :) I'm working on it! Edit: Thanks to Louisa for telling me that if you click on the draft, it will 'embiggen' the tiny draft! A note to Mac users: they are working on a program for you but it is being written from scratch. They are establishing which versions of Apple / Mac programming to include as it seems you get a lot of upgrades. When its released it will feature many more items that we PC users will have to wait for in a future upgrade. In short it will be worth the wait!